This course is offered for students who took Tai Chi Instructor Training Course I and II, or for people who have practiced Tai Chi/teaching Tai Chi for over 5 years. You will continue to learn and refine silk reeling skill, Tai Chi Push Hands, Tai Chi Martial application, two people Tai Chi practice (Tai Chi in Harmony). We will also refine Tai Chi form 42 Steps Combined style. 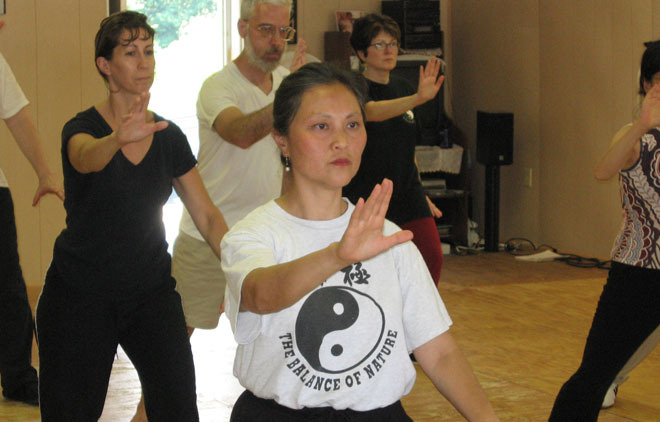 At the end of the training, students will receive certification for Tai Chi Level III under Dr. Kuhn. "Thank you Dr. Kuhn for your encouragement, knowledge, and experience. I learned way more than I ever dreamed. I recommend this program to anyone!!!!" "This was truly amazing to be a part of this week. My personal body is healing from Tai Chi and the herbal medicines (Dr. Kuhn gave me) are amazing. I am feeling much better. Thank you! Thank you!" "Thank you Dr. Kuhn for your outstanding wisdom, your concerns for my health, and your efforts in teaching with integrity according to the tradition. Thank you for teaching Tai Chi form to a deeper degree by incorporating the gathering of inner Qi (Chi)".